Have you run out of time to shop for your sister’s birthday? Or maybe you need to send a sympathy sentiment to a friend who lives across the country? Shopping for a gift basket online is an easy way to satisfy your gifting needs for many different occasions like new baby arrivals, thank you’s, congratulations, illnesses and many more of life’s events. There are hundreds of gift basket companies to choose from. Where do you start? Hold on a minute. As an eco-conscious consumer, you may be thinking, “Aren’t gift baskets a waste of resources?” Not always! Several of the top gift basket companies we’ve reviewed follow eco-friendly and socially-responsible business practices — to jump to those companies, click on one of the links below. FYI, all seven companies listed here share their earth-friendly details on their websites. So, we can share them with you. GlobeIn is a perfect gift option for anyone committed to fighting poverty in developing areas around the world. This unique online gift box company sells handmade, ethical and fair-trade goods to help struggling artisans provide for themselves and their families. Deepak Chopra is one of their company advisors. 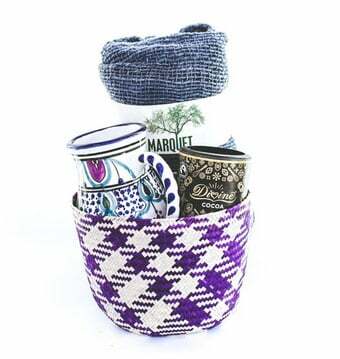 They carry a wide variety of handmade items made everywhere, from Mexico to Ghania and beyond: woven baskets, pottery, blankets, jewelry, scarves, kitchen ware, soaps, cocoa and much more. GlobeIn offers individual products or two monthly gift box subscription options. With their premium gift box subscription, you can select from several themes each month. You can also choose 3, 6 or 12 months of deliveries. 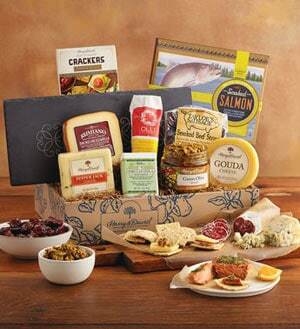 Food deserves a section all its own when it comes to gift basket companies. There are SO many options; we decided to break food gift baskets down by categories. Click on a link below to jump to your fave food or just keep reading for the best rated gift baskets. Harry & David started out in 1934 as a pear farm and has grown into a well-known gourmet food gift service. Their gift baskets are high-end in both appearance and quality. Although they don’t offer as wide of a variety of gift baskets as some of their competitors, you can order some delicious premium baskets of international cheeses, fruits, sweets, condiments and more. 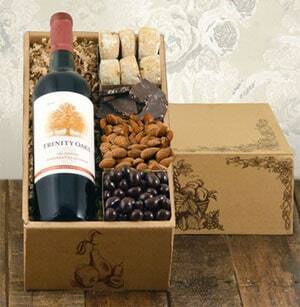 You can also add a bottle of wine to many gift baskets. Their non-food choices are few, mostly flowers and plants. Their eco-friendly practices? They offer an organic fruit basket and an organic fruit-of-the-month club. Harry & David ensures a green company commitment, from sustainable farming and energy conservation to participating in the Green Tag program, which promotes wind energy in Oregon. 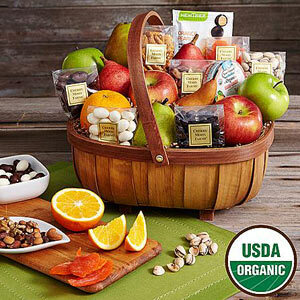 Shari’s Berries, an all-food delivery service, wins our best organic gift basket title. All of their organic selections are 100% USDA certified organic produce, and you have some delicious options — farm-fresh sweet fruit, gourmet snack selections, organic chocolates, organic olive oil gift assortments and even organic California wine. If you want to kick your gifting up a notch, they offer several organic fruit club of the month selections (three, six or 12 months). Shari’s Berries also has a ton of elegantly presented non-organic gift basket options, including gourmet meats, cheeses, baked goods and more. Shari’s Berries is an FTD company (the popular flower delivery company), which holds a Fair Trade designation and a Veriflora certification for sustainable growing and ethical environmental and labor practices. Although technically not a gift basket service, FruitBouquets has some of the most creative fruit bouquets we’ve seen for all kinds of occasions. 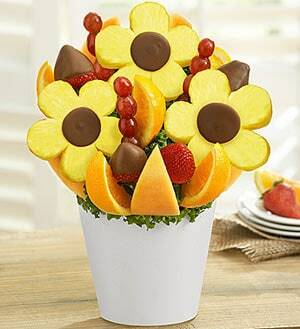 Most of their bouquets are a cute mixture of carved fruit, chocolates and chocolate covered fruit. Yum! You can even order birthday brownie pops, balloon additions and chocolate covered jalapeno peppers for your more adventurous foodie friend! FruitBouquets isn’t the site, however, where you’ll find gourmet cheeses and wine. They only have one organic gift selection, but the company, a sister site of 1-800-Flowers, is committed to eco-friendly practices. The Gourmet Chocolate of the Month Club is a perfect gift for the ultimate chocolate lover in your life. Every month, your gift recipient will get a pound of innovative hand-crafted chocolates from world-class chocolatiers. The Club hand-picks only the finest, award-winning chocolates from artisan boutiques around the world for its monthly deliveries. 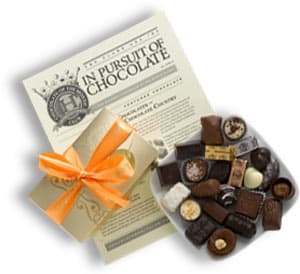 Membership also includes a personalized gift message and an informative newsletter about each chocolate selection. You have flexible gift ordering options, from two to 12 gift shipments or an ongoing gift subscription. The Gourmet Chocolate of the Month Club works closely with small eco-friendly chocolatiers around the world. Winebasket.com is a family-owned and operated gift basket company, offering gifts for just about any occasion. They specialize in wine baskets but also feature baskets filled with champagne, unique gourmet foods, and fruit baskets too. We were impressed with their variety of 80+ different wine baskets, some for as low as $29.99. The wine selection ranges from vineyards all over the world (France, Italy, USA, Chile) and feature a diverse selection of reds, whites, roses, and champagnes. They even offer a few beer and spirit options. There are also plenty of gourmet food pairings with each basket. Their site is easy to navigate, has overall excellent customer reviews for individual baskets, and they offer free shipping on many gift baskets. You can also customize your order if you include the details in the “Special Instructions” section of the online order form or call. There are hundreds of gift basket companies to choose from. We’ve broken down our best gift basket reviews into categories to help you narrow down your search. Gift Baskets Plus offers a wide selection of unique gift baskets. The variety and “cool” factor of their gift baskets for men outdoes other gift basket companies. Want a sports-oriented gift basket? 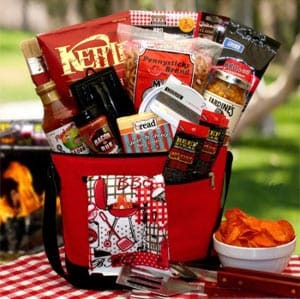 Gift Baskets Plus has many themes, including golf, football, fishing, hunting and more. They don’t stop there. Gift Baskets Plus also has many unique gift baskets geared toward women, kids and all types of occasions you can imagine. Gift Baskets Plus is a huge plus in our book. GiftTree is one of the best gift basket companies we’ve seen for their variety, pricing, presentation and personalization options. If you’re looking for non-food gift baskets, here ya go. They have gift baskets for more occasions than most companies we’ve reviewed. 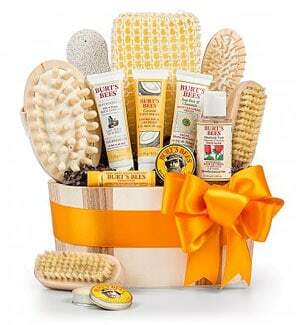 GiftTree is a real stand out when it comes to the best gift baskets for women with spa gift baskets galore. They also have baskets full of chocolate, wine, champagne, gourmet food, candles and aromatherapy. Personalized jewelry and roses. What more does a girl want? They even offer same day shipping for many basket selections. The downside? GiftTree has very limited organic options, and there’s no information on their website about eco-friendly practices. Hayneedle is the go-to site for your new baby gift basket needs. You have more than 100 different baby gift basket selections for baby boys, girls and twins. They even have a couple of organic baby baskets. 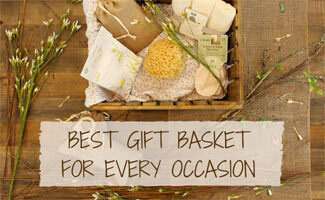 Hayneedle has a huge selection of gift baskets for nearly all kinds of occasions you can imagine. 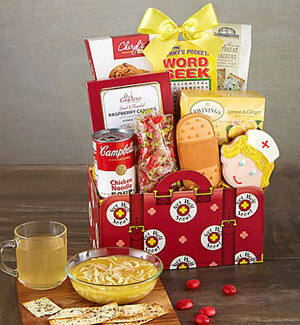 Their baskets are creative and fun, and they offer some popular name brands like Starbucks, Godiva, Mrs. Fields and more. The only downsides to Hayneedle, from our Earth’s Friends perspective, are their sparse organic gift basket options — and the company doesn’t appear to strive for eco-friendly practices (at least, we couldn’t find any information on their website). 1-800-Baskets has more than 50 sympathy gift baskets, ranging from gourmet food and cakes to tea and fruit. They also offer gift baskets with an angel statuette and a “Words of Comfort” book. Each basket comes wrapped with a tasteful “In Sympathy” ribbon. They offer a wide variety of pricing. Overall, 1-800-Baskets isn’t the best gift basket service we’ve seen. However, they do have a decent variety of selections for many occasions. Their prices are also reasonable. A big plus in our “Earth’s Friends” book is the company itself. 1-800-Baskets is a sister site of 1-800-Flowers, which holds a Veriflora certification for supporting sustainable growing and a Fair Trade designation for a commitment to ethical environmental and labor practices. A Gift Basket Or Flowers? Gift baskets are great options for those hard-to-buy-for people in your life or the person who has everything. We hope we’ve given you some new sources for your gifting needs, regardless of the occasion or your gift’s recipient. Your gift basket options are nearly limitless and we want you to be able to give the best gift baskets online for your special occasion! If you’re not set on giving a gift basket, consider sending flowers to show someone you’re thinking of them. What are some of the most unique gift baskets you’ve ever seen? I have a friend graduating from college what kind of basket would you recommend? Gale it depends what your friend’s food preferences are but Blue Apron is a good basic one to start out with in the meal kit delivery services. Steven, this company looks amazing, thanks for sharing! We’ve add them to our list to consider adding a review of in our next audit. Love a company that is all about a good cause and supporting local makers around the world! This is awesome I’ve been searching around trying to find ideas for client gifts this year and this has a bunch of options that should cover everyone on my list!